Yay, third place on the national lead competition! Last week Roeland van Oss succesfully passed his final guiding exams. Meaning he's now an official UIAGM mountain guide! So if you want to get into the mountains and you're looking for a passionate, driven, enthusiastic, energetic and friendly mountainguide: mail Roeland! Petzl International filmed the whole event, so soon we can watch a proper movie about it. And, one of the teams, Fire brigade Rotterdam had been trained by Ascent. Ascent is a Dutch company that provides specialised rope work/rescue training. I also work for Ascent. Reason enough for me to take a close look at the rescue teams from all over Europe. It was interesting to see how different countries have a different approach on the rope-access. Some were 'caving orientated' others more 'alpine orientated' and there were also more 'industrial orientated' groups. It was good to see how proper the Germans and Swiss were with their techniques. All ropes properly sorted, all team members with their known positions, and proper handling with the ascender/descender devices. Though, Werner said the skills have been improved in the years. A couple years ago he wouldn't want to get rescued by any of the teams and now he'd consider calling a rescue team in emergencies. This Sunday I had my own competition. Climbing gym Monte Cervino hosted the national lead-climbing competition. The third (out of 3) competition of the season, resulting in a National Championships. I'd been competing on this series before. Last year I joined all comps, but I decided that outdoor climbing was much better. The 2011 competition was not too much fun. 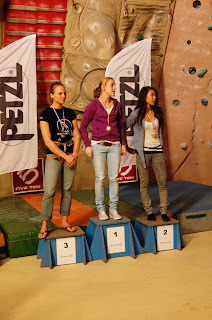 Horrible climbing gyms who still owe me a price I won last year (Dear Mountain Network Nieuwegein, am I ever going to get the shoes I won over a year ago?) and some judges that act like little dictators. But this competition was different. Same judges but awesome routesetters (Jeroen, Dimitri, Arvid), my favourite belayers (Arvid, Rens and Tineke) and good supporters (Michel, Rutger, Bos and the whole Monte Cervino crew). I'm always incredibly nervous on competitions. Resulting in being totally disorientated in routes, soggy-sweatty hands, squeezing holds like my life is depending on it, and a mind that keeps on talking to me whilst I'm busy climbing. So proud of her! She managed to climb the route, did it all just perfect! I had to climb that route as well (of course) and with my nerves I was totally disorientated, but managed to top it. The yellow, second qualification route was harder (I knew that) meaning it would be harder to top the thing. But also harder to keep my mind focused. I got so extremely pumped! I had to rest on every move, had to regain my focus again and again... I fell just after the big sloper... I was down on the ground again before I knew it. Almost tears in my eyes because I was so insecure. Apparently it was good enough to reach the finals. So I should have been happy. But my mind was telling me I should have done better. So I had the finals. Arvid belayed me. I really trust him and he's very motivating as a climbing partner. Nevertheless I was still really nervous. Sweat was dripping off my hands. I had to chalk on every move and then I made a mistake. Geatan, a French friend described it: "It's like when you work a very hard route, you know that you can send it but it is so hard that you also know that you can fall at the crux. Everything is in your mind." So far I was first with just three climbers to go. One fell before me, so I was already third. Then Nikki had to climb. She did so good! After the comp she told me she just wanted to finish the route. No nerves, no pressure, just her and the route. And it worked, she topped! Then Tabitha had to climb, she clearly had more difficulties with the route then Nikki. But she got higher then me. So, was was third. Nice! The men did good as well. Tim Reuser just missed the top-hold in the finals. But that was more then good enough to become first. Tim is strong, really strong with just a few years (5 years?) of climbing experience he's doing really well. It's so motivating to reach something you can be proud of! It gives me energy for all the next steps. I know, I was not as good as Nikki, I was not first but still...happy to get this far now, with more training (motivation for training) and a better focus (less nerves) I could do even better I guess.